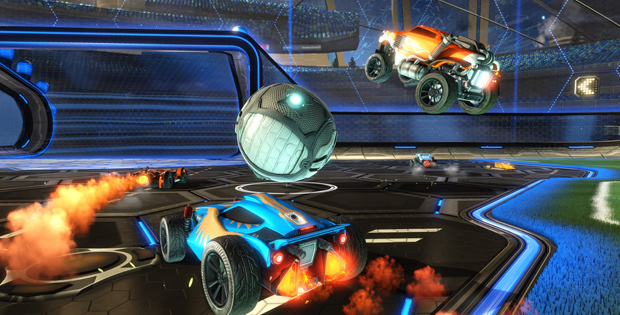 Rocket League is dominating the games conversation right now. Self-described as soccer with cars, the game pits teams of three in a showdown between vehicles. The challenge — score more goals than the other team in five minutes. It’s a simple concept, one tried earlier with the developer’s own Supersonic Acrobatic Rocket-Powered Battle-Cars, and it works well. It’s a bit more Ice Hockey than soccer — it’s a full contact, anything goes sort of endeavor — but once you get a handle on it, it becomes highly addictive. The concept is simple enough that we’ve seen it before. I’m seeing it compared to Twisted Metal and Mario Kart’s battle mode, but it reminds me more of Quake 3 Gridiron. Or, more recently the brilliant (but complex) Supraball.